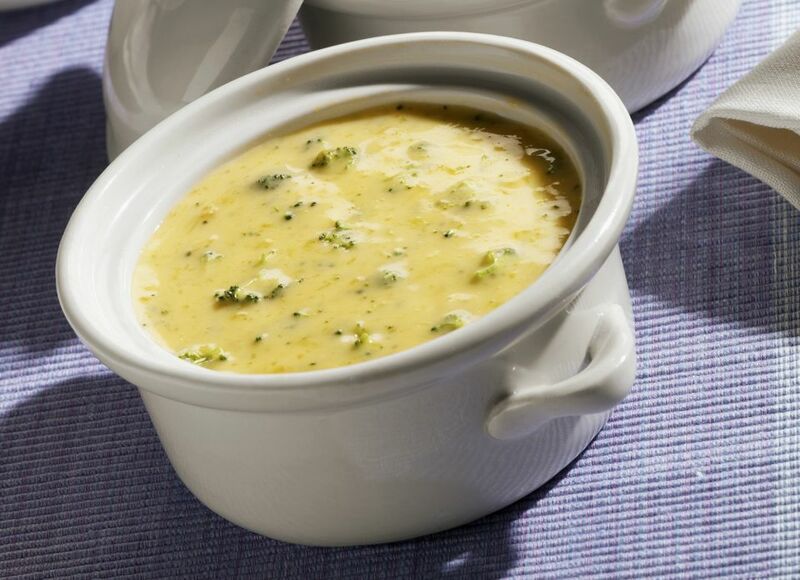 Reminiscent of warm and comforting broccoli cheddar soup, this broccoli cheese dip is sure to be a hit at your game day party or any other gathering. This dip requires just a few ingredients (chopped broccoli, cream of mushroom soup, sour cream and Velveeta cheese) and minimal prep work. The dip is versatile as well. For a more colorful presentation, add about 1/2 cup of chopped roasted red peppers or pimiento. Or, for extra flavor and texture, saute 1/2 cup of chopped onions and about 1 cup of sliced or chopped mushrooms in about 1 tablespoon of butter or olive oil and add them to the cheese along with the broccoli. For more complex flavor, add a teaspoon or two of Dijon mustard. This combination makes an excellent potato topping, too. Just prepare it and use it as a topper on baked stuffed potatoes or potato skins. Or thin the dip with some cream, milk, or beer and serve it as soup with crispy croutons. The recipe makes a big batch of dip; if you want to prepare it for a family snack or movie night, just scale the ingredients down by half. Cook the frozen broccoli on the stovetop or in the microwave following the package directions. If using fresh, see the instructions below. Drain the broccoli thoroughly and set aside. Cube both kinds of cheese and place it in the slow cooker. Cook on low for about 1 to 2 hours, or until the cheese has melted. In a bowl, combine the condensed soup, sour cream, chopped cooked broccoli, and garlic powder. Blend well. Add the soup and broccoli mixture to the melted cheese. Stir to blend thoroughly. Keep crockpot on warm—or on low if there is no warm setting—and serve it as a dip with tortilla chips. To steam fresh broccoli on the stovetop, put the chopped broccoli in a steamer basket in a saucepan with about an inch of water. Place the pan over high heat and bring the water to a boil. Reduce the heat to low, cover the pan, and cook for about 4 minutes, or until the broccoli is just tender. Drain well. While serving from the slow cooker, stir the dip from time to time to keep it well blended. To use fresh garlic as a replacement for garlic powder, peel and mince 3 to 4 cloves of garlic. Saute the garlic for about 1 minute in a few teaspoons of butter or olive oil. Add the garlic to the soup and broccoli mixture.